The Apple Story Seat was inspired by the popular children’s story ‘The Hungry Caterpillar’ by Eric Carle. 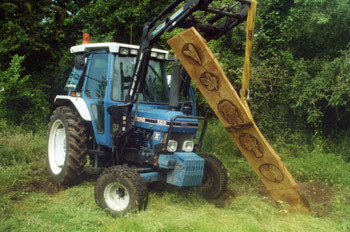 The Seat was part of a New Garden Project at Charles Kingsley’s Primary School, Eversley in Hampshire. 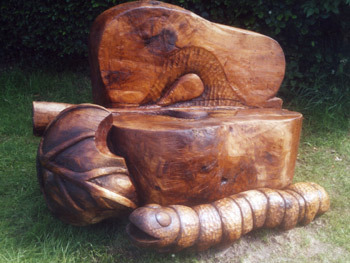 Carved from a huge block of Oak and measuring 1m50 across, it shows the core and pips inside the Apple together with a giant caterpillar that has just taken a bite out of the leaf. 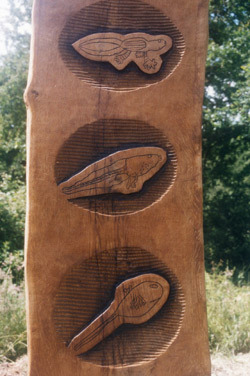 Three carved Oak slabs 2m60 tall depict the children’s drawings of ‘cycles’ relating to the science curriculum, i.e. 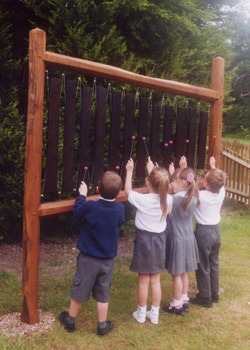 A Musical Play Structure, with tuned Mahogany Keys strung in an Oak Frame and standing 2 metres tall.